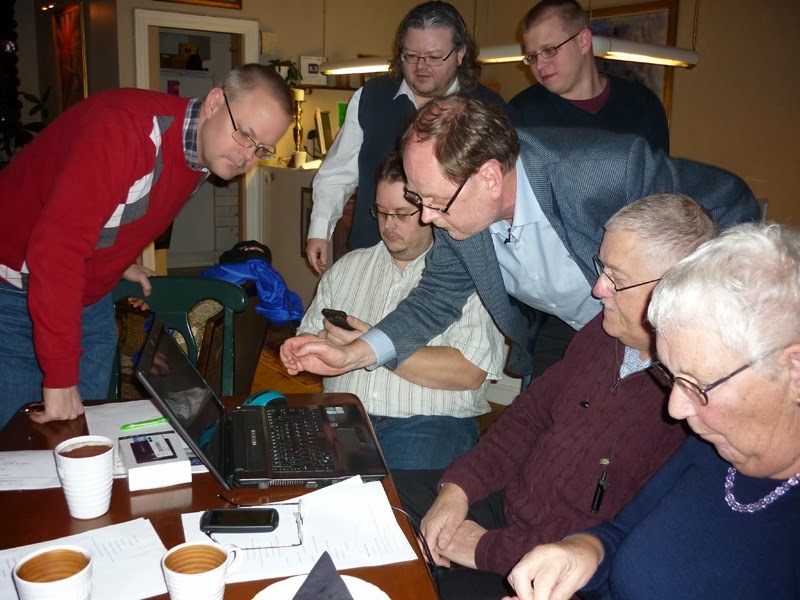 On Tuesday February 25 the AFU board gathered for the annual meeting. The most important decision during the meeting was to readopt the foundation bylaws from 1980. The reason for this is explained in the quotation from the Annual Report 2013 below and also the legal problems of changing our name. 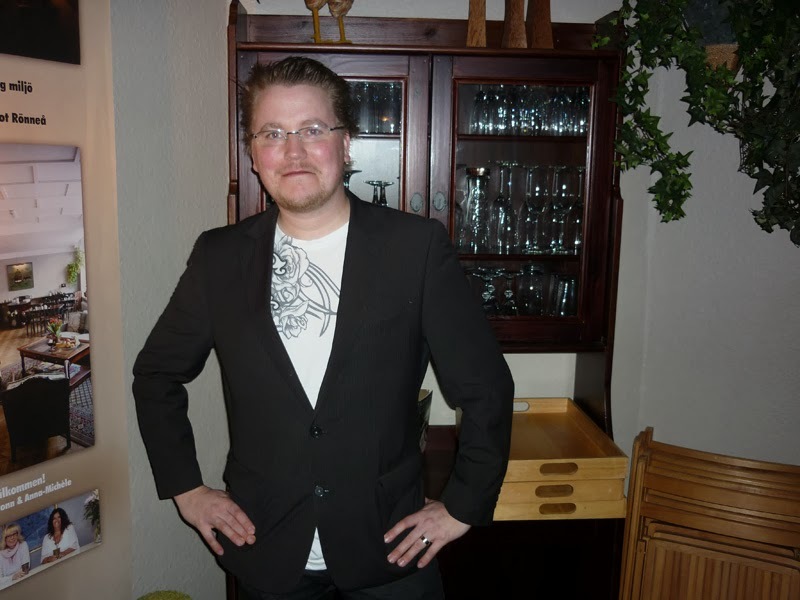 The AFU board now has the following members: Håkan Blomqvist (chairman), Clas Svahn (vice chairman), Anders Liljegren (treasurer and personnel manager), Leif Åstrand (deputy member). 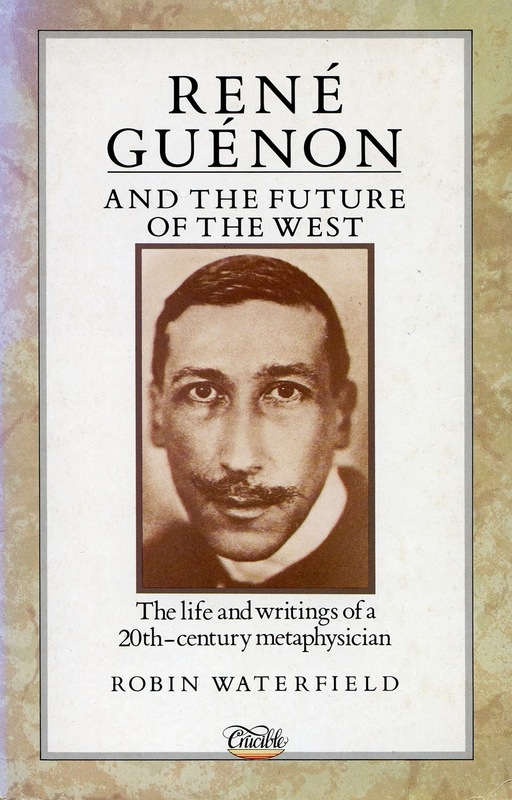 "Donations of very extensive collections of forteana, ancient mysteries, parapsychology, paranormal phenomena, folklore, spiritualism, esoterica and other borderland subjects have for several years initiated a discussion within the board of eventually changing the name of the foundation to present a more accurate description of the wide scope of our collections and work. We wanted to keep our well known acronym AFU but give it a new and more inclusive meaning. 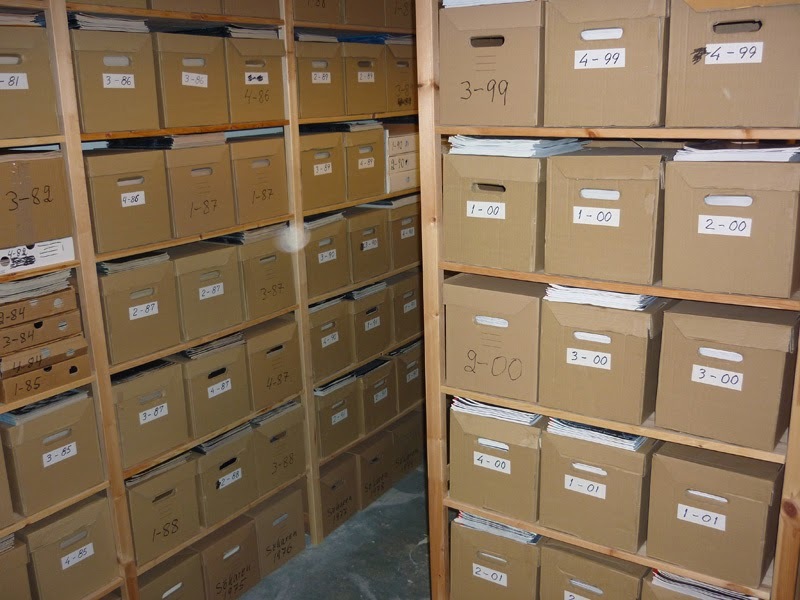 In April the board decided that our new name shall be Archives for the Unexplained. 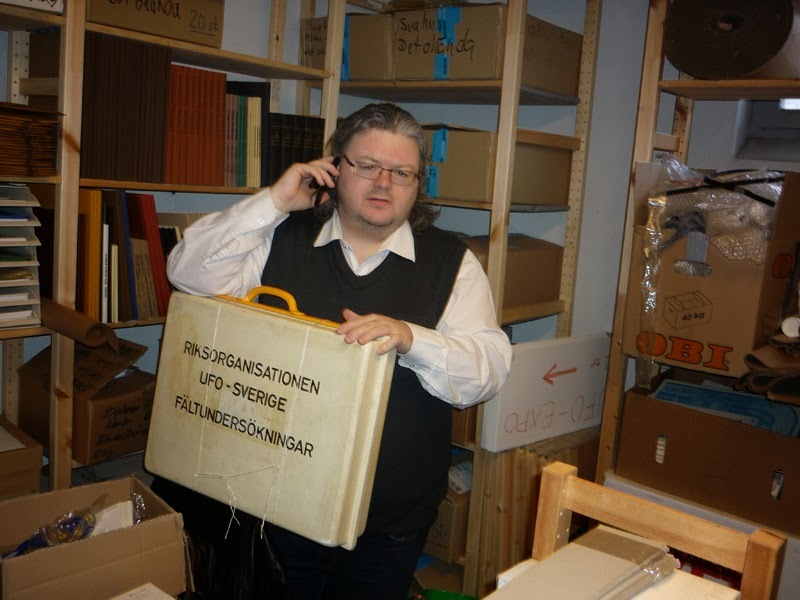 Problems arose when we asked for authorization of the new name from the Östergötland County Administration Board. Changing the name for a foundation proved to be more complicated than we had anticipated and we were also informed that foundation bylaws cannot be altered except under very special circumstances. 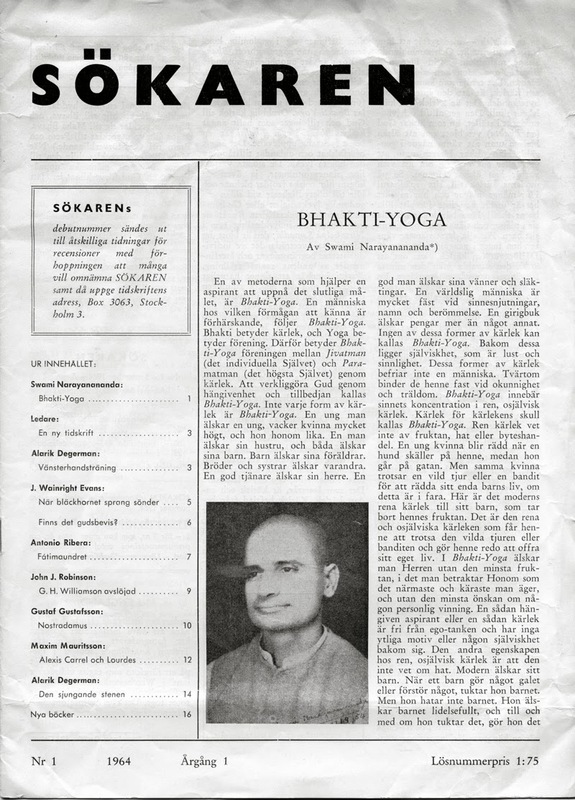 A decision was taken to readopt the bylaws as originally written in 1980. 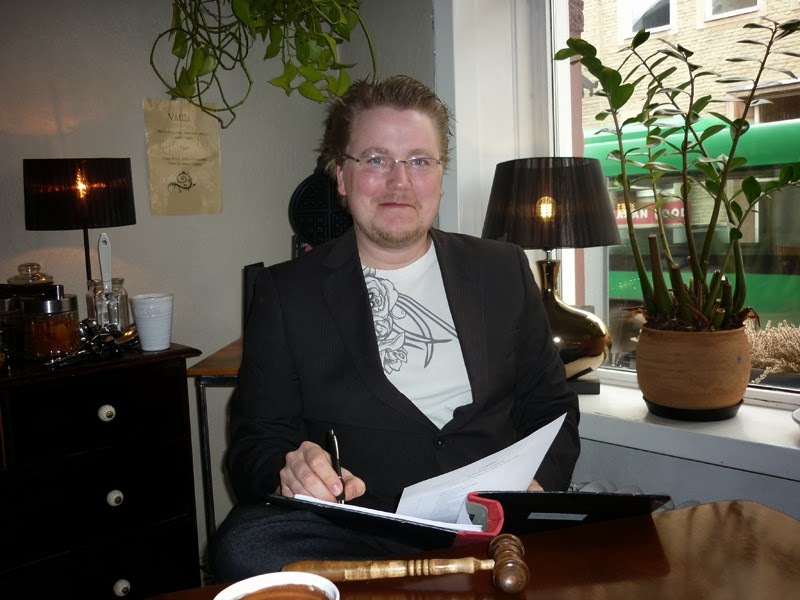 As of this writing the Östergötland County Administration Board has not finally authorized our new name but we hope to receive an answer in the near future." 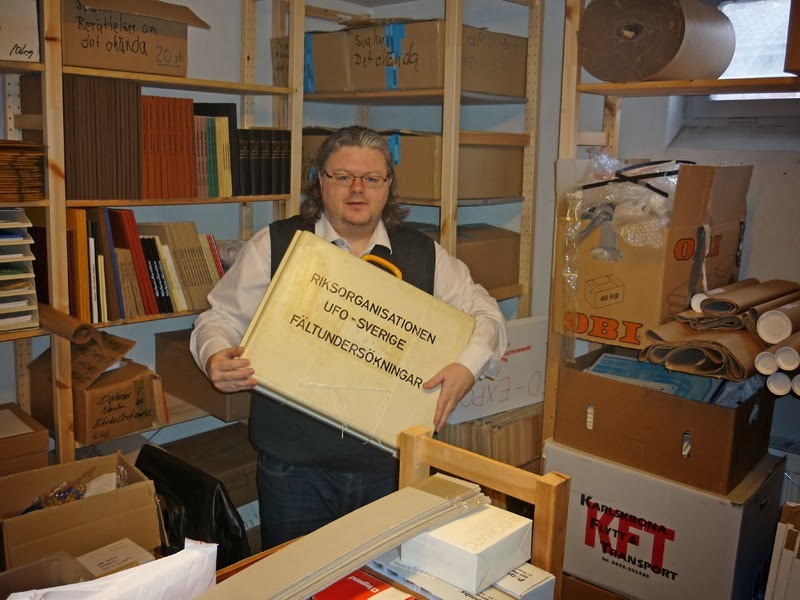 Before the board meeting we unpacked the latest donation to AFU, the Sune Hjorth archive, collected by Clas Svahn and Carl-Anton Mattsson as I mentioned in a recent blog entry. 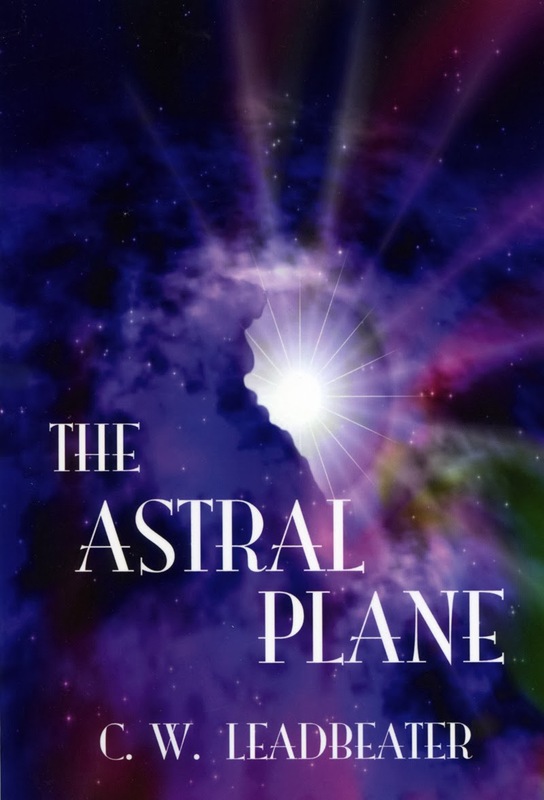 Many new contactee, conspiracy and new age books added to the AFU collection and also some very interesting correspondence from a.o. 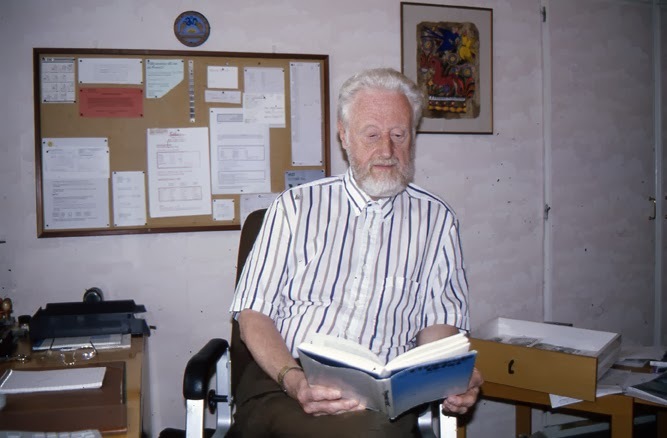 Immanuel Velikovsky. 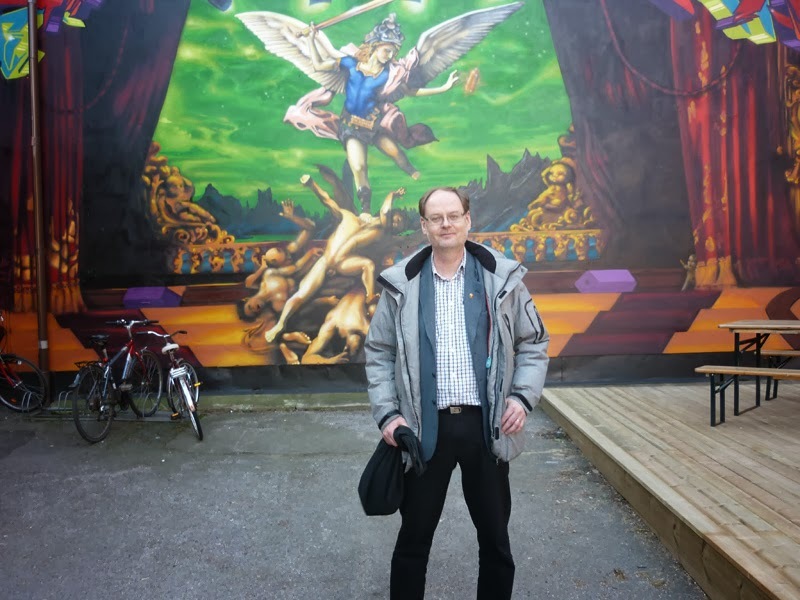 On Tuesday nine people from AFU visited a place called Hallarna in Norrköping, an old industrial complex now transformed into a center for cultural activities and organizations. 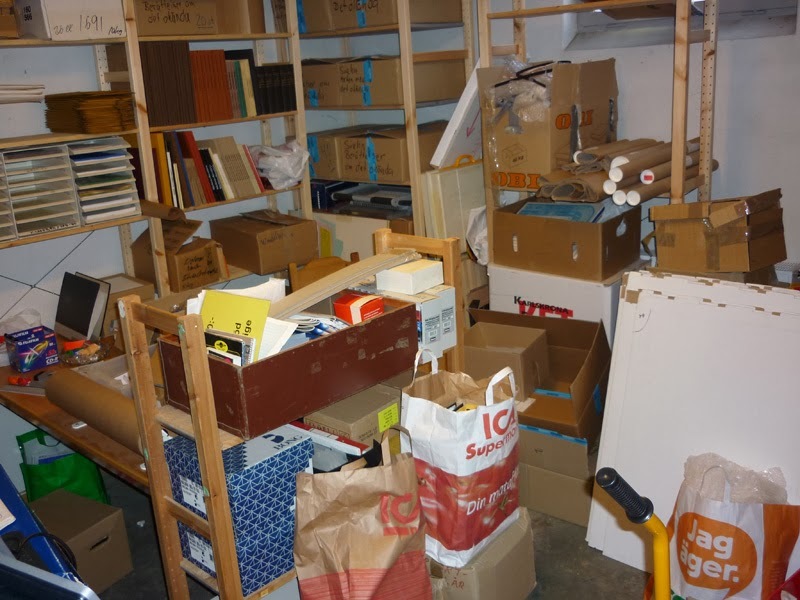 We wanted to inspect the premises as a possible location for the entire AFU collection. 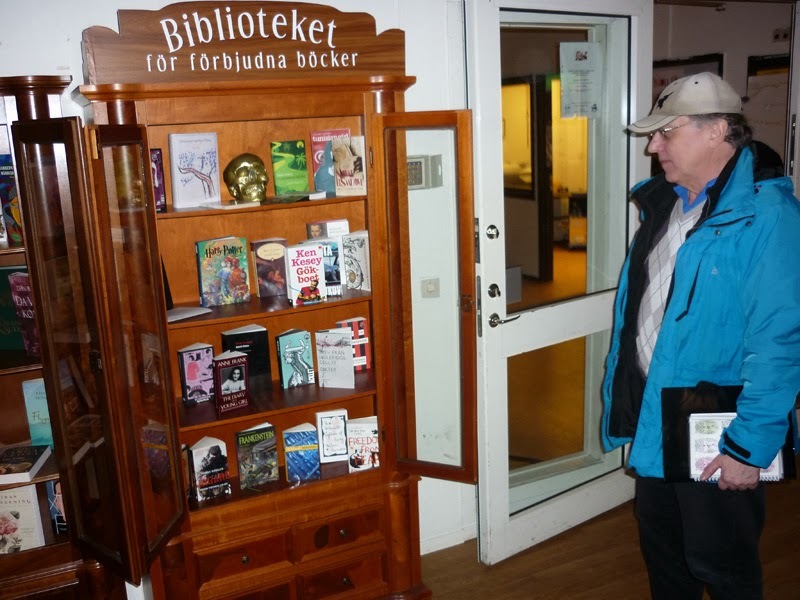 Administrator and leader for this project is Pelle Filipsson who guided our group in this large building. Whether it will be possible för AFU to move to this premise is entirely dependent upon the economical situation. A more secure economy is necessary for a move to one large premise. 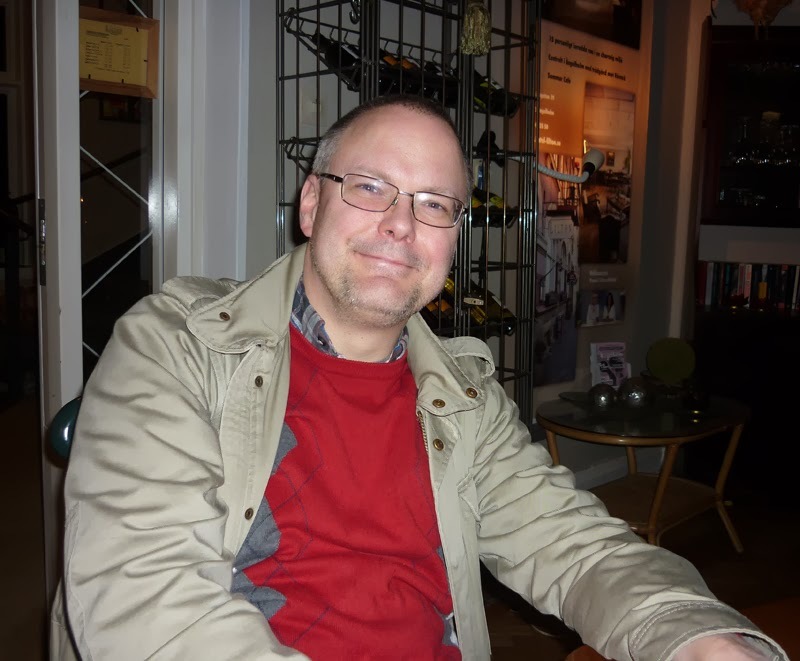 We will continue our discussions with Pelle Filipsson and he will keep us posted on new developments regarding this cultural project. 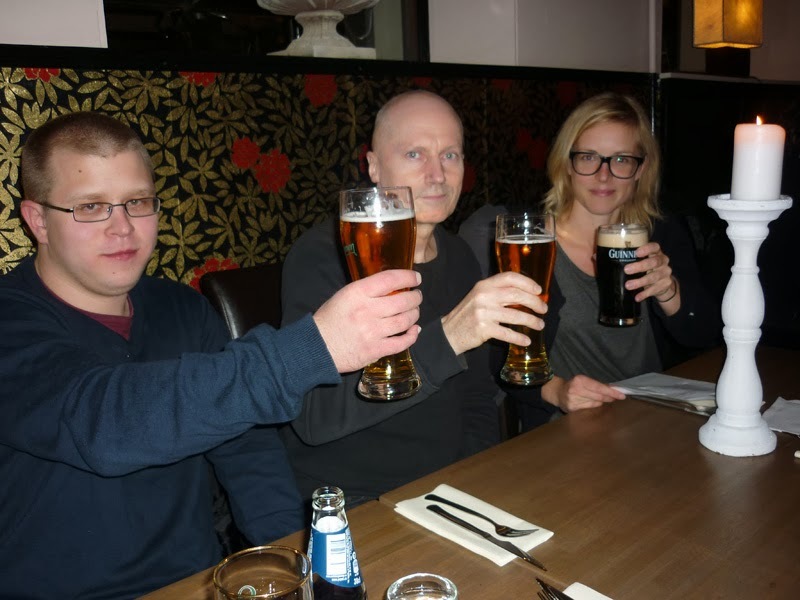 Once every year in January or February the UFO-Sweden board travel to Ängelholm for a board meeting at the small and charming Lilton Hotel. This has been a tradition since 1998. 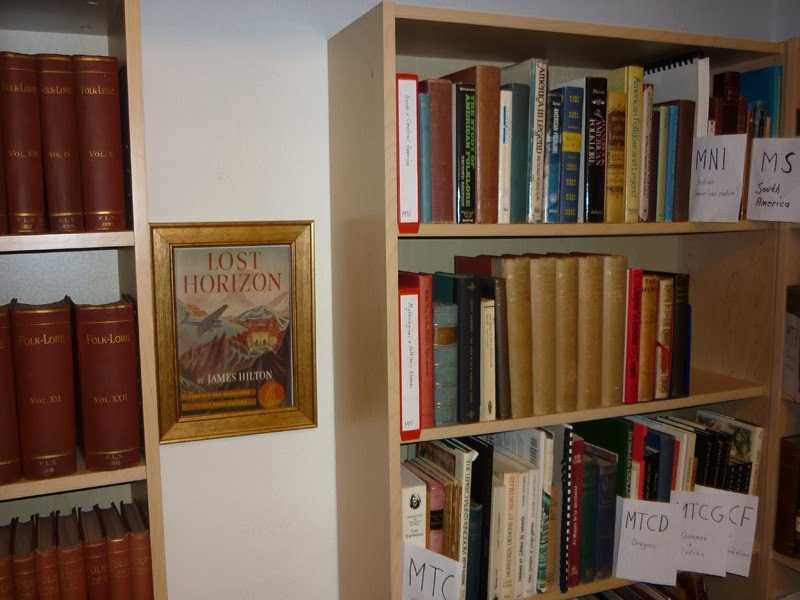 It´s a long journey for most of the members but well worth the trouble because of the excellent lodging and enjoyable get together with both new and old ufologists. For our new chairman, Anders Berglund, this was his first visit to Lilton but he was also full of enthusiasm for this picturesque place. Together with the film crew Kerstin and Michael we were 17 people around the table when the meeting started at 2.30 p.m. We decided that the annual UFO-Sweden meeting and exhibition will take place at Östersund on May 17. There will be a focus on the local sea creature Storsjöodjuret (The Great-Lake Monster) said to inhabit this large lake. 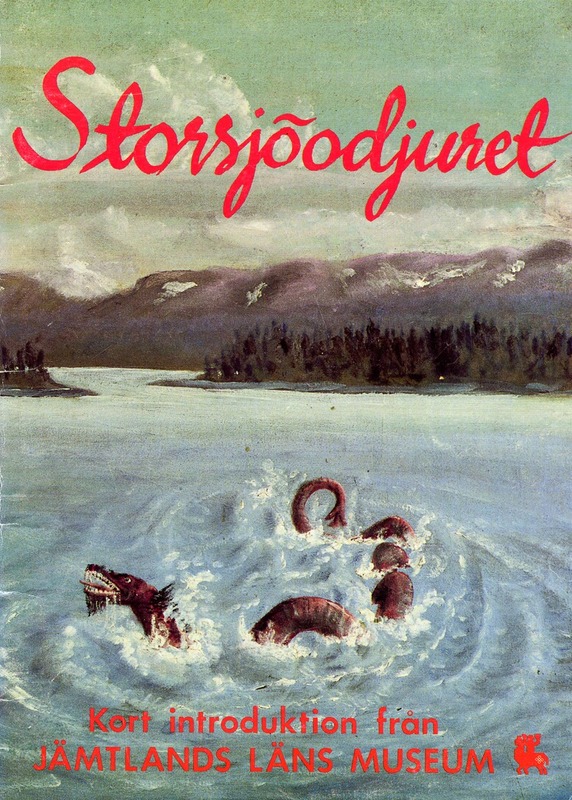 The Nessie of Sweden, observations reported for many years. 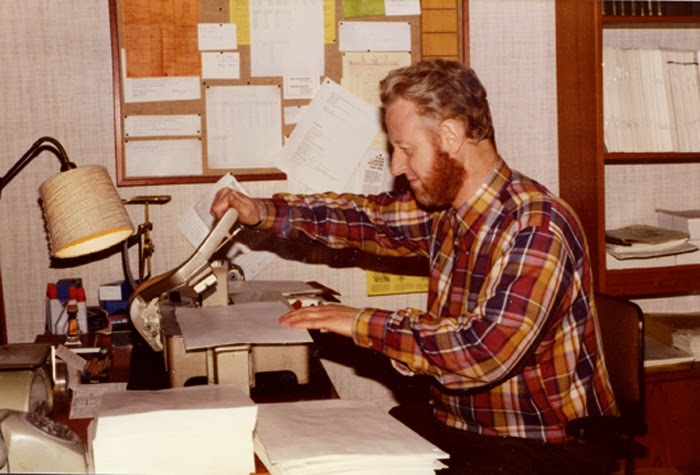 There will also be a renewed investigation of lake Nammajaure in the north of Sweden, trying to locate the strange missile that landed and sank in the lake in July 1980. For the next year we are planning a detailed investigation of the Kolmården area, north of Norrköping. 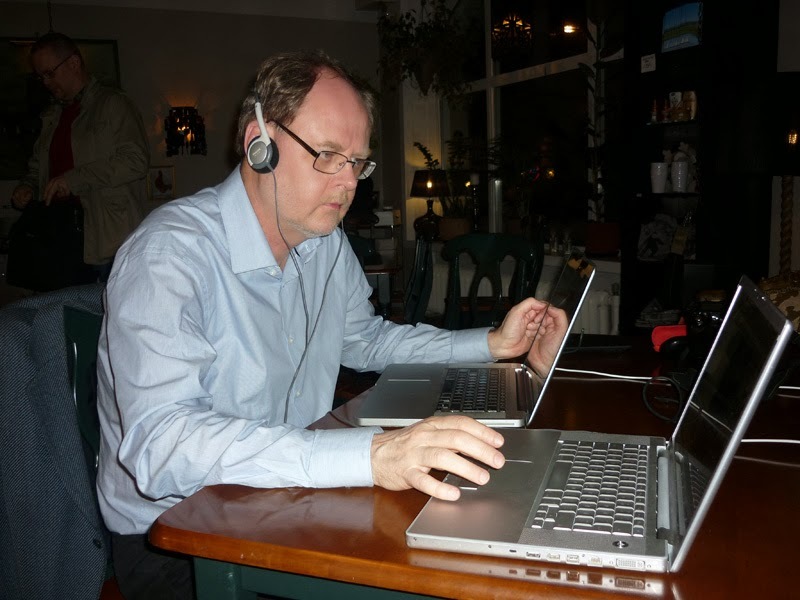 Going from house to house interviewing and documenting all UFO and paranormal phenomena. 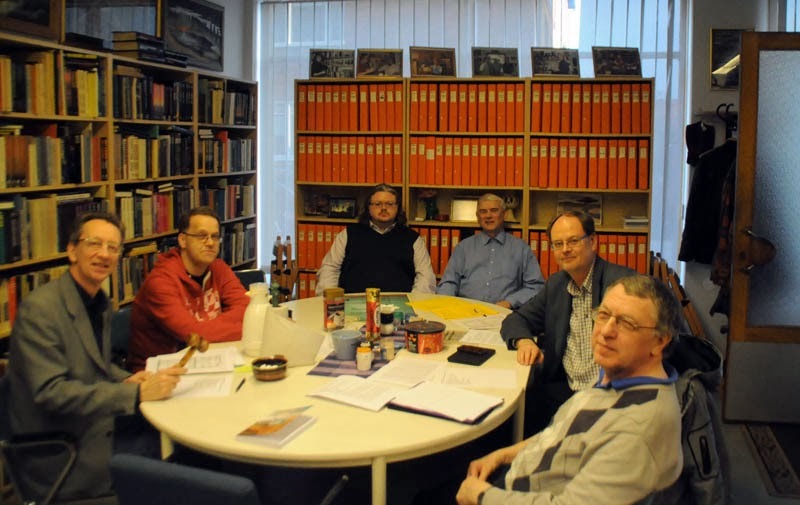 During our board meeting we also approved two new UFO-Sweden local representatives, in Karlstad and Vetlanda. 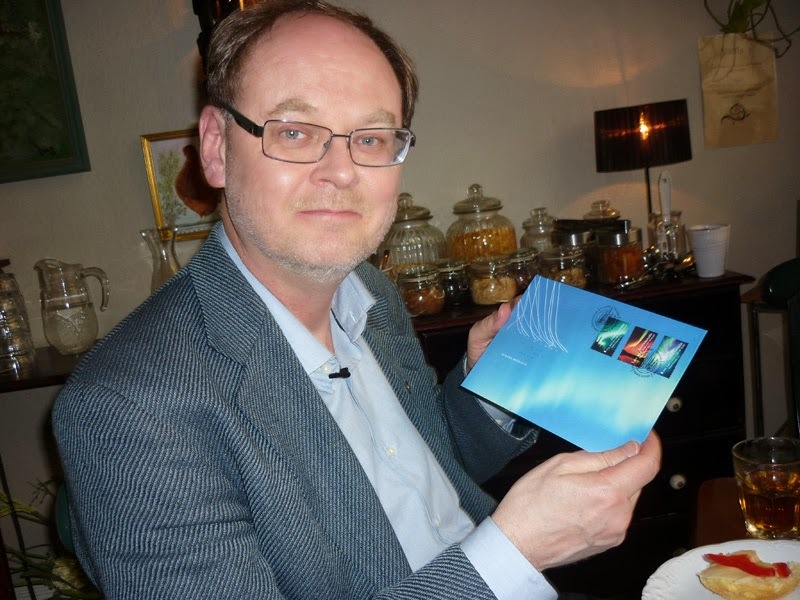 And we greeted our new active member, journalist Magnus Gatemark, welcome to the UFO-Sweden gang. Close to 7.00 p.m. we all walked to our favourite restaurant in Ängelholm, Telegrafen. 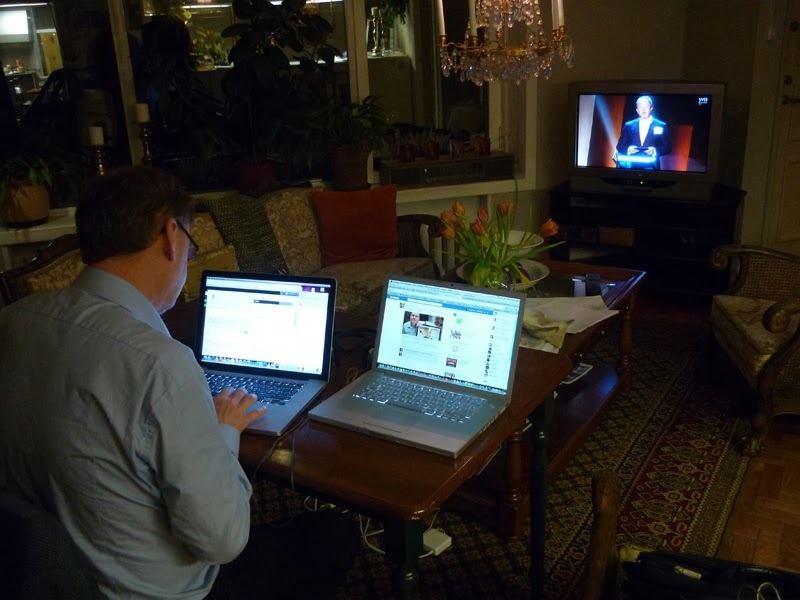 All except journalist Clas Svahn, who had to stay at the hotel watching the musical competition Melodifestivalen, chatting with listeners. 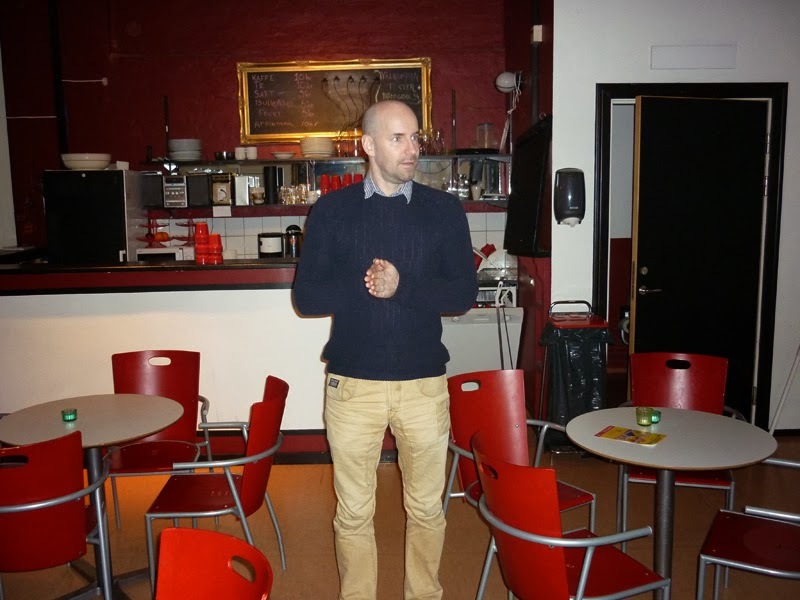 During this event decision is made who will represent Sweden at the European Song Contest. The rest of us were surprised by a very heavy hailstorm on our way to the restaurant. But we arrived safely, although somewhat wet. We all enjoyed an excellent dinner before going back to Clas, who after his work, went for some hamburgers. The rest of the evening, and part of the night, consisted of the usual discussions, planning, anecdotes and jokes in good company. 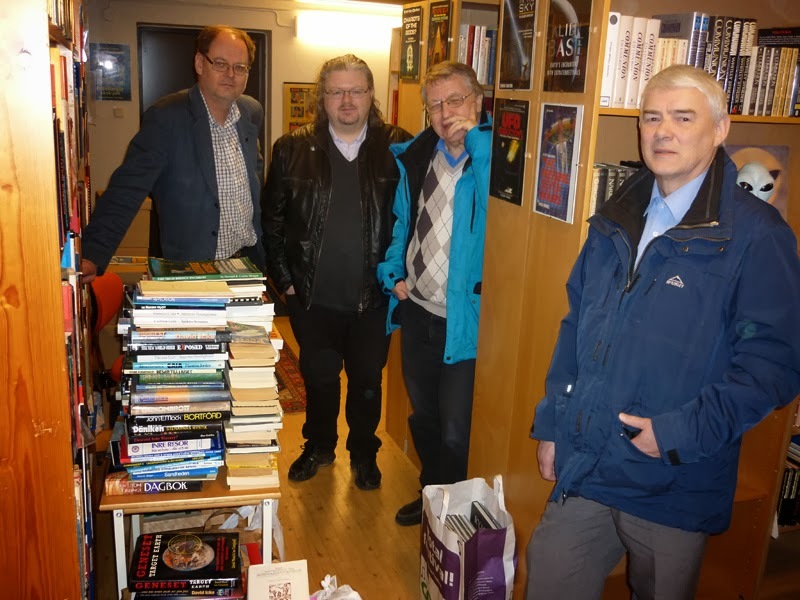 One of the really nice aspects of our UFO-Sweden meetings is exhange of gifts. 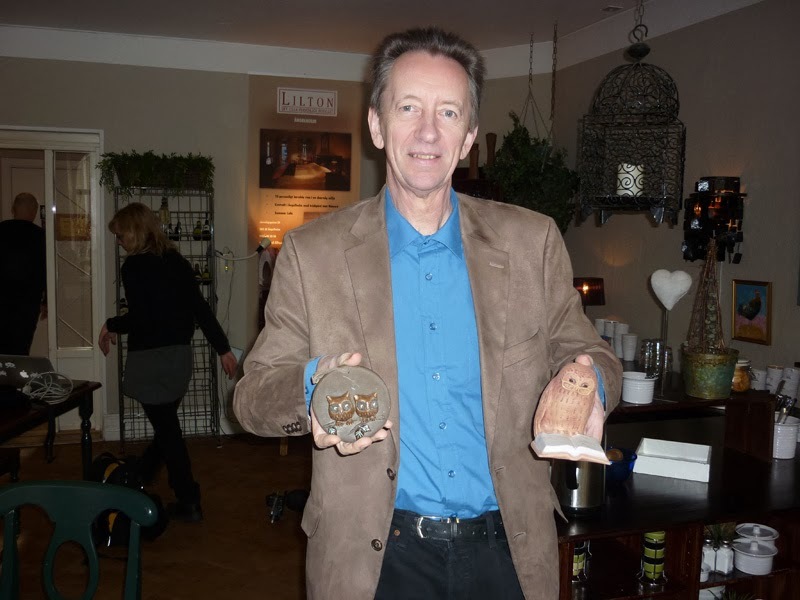 I collect owl figurines and Clas is an avid collector of stamps with UFO and space themes. We were both happy to receive new samples for our collections. 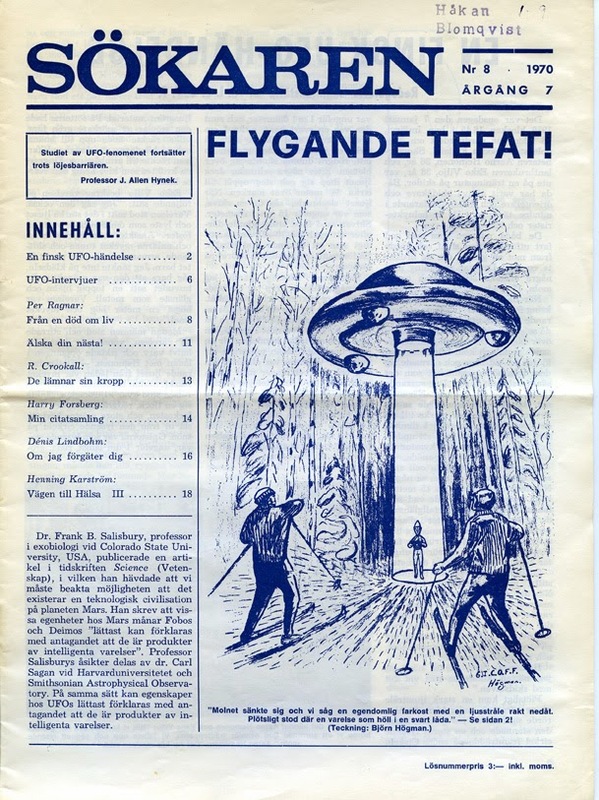 As a young and very enthusiastic ufologist of 20 years, in 1972, I wrote my first editorial in the newsletter of our local UFO group in Södertälje. 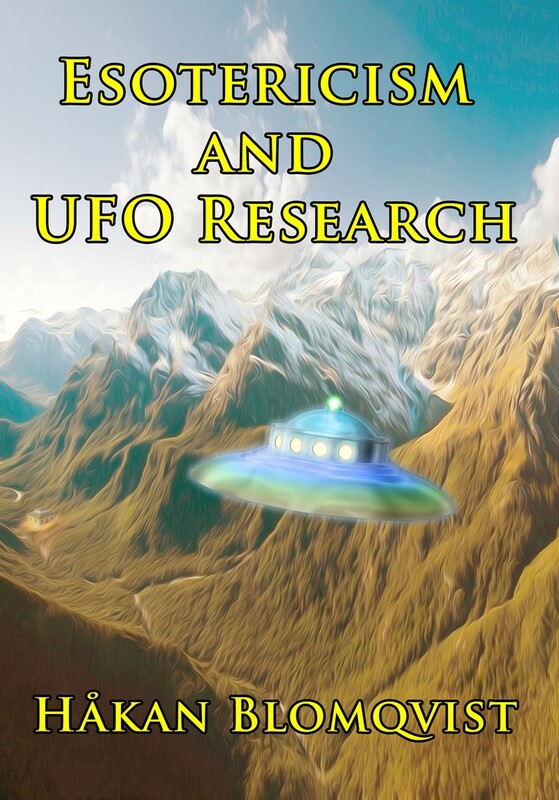 Although somewhat naive and overly idealistic the editorial is an appeal to study not just UFO reports but many other subjects necessary to understand the scope and depth of the enigma. 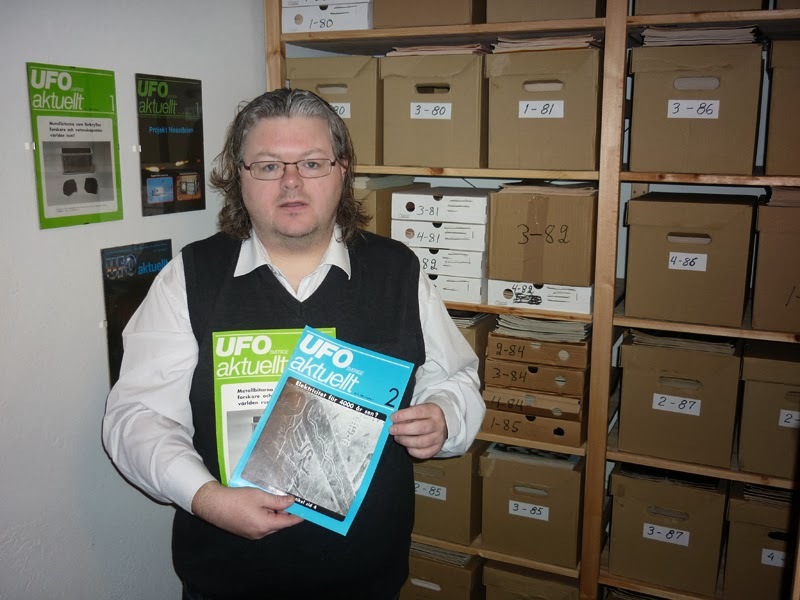 Here is a short quote from the newsletter: "Studying UFO is not just a hobby or pastime. It is an education. 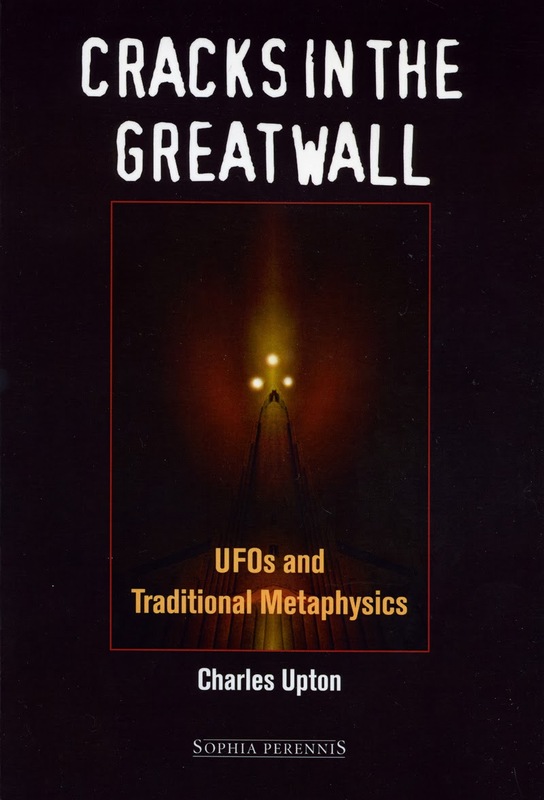 To get a better understanding of the problem you also have to study topics like astronomy, physics, ancient cultures, philosophy, parapsychology a.o.". 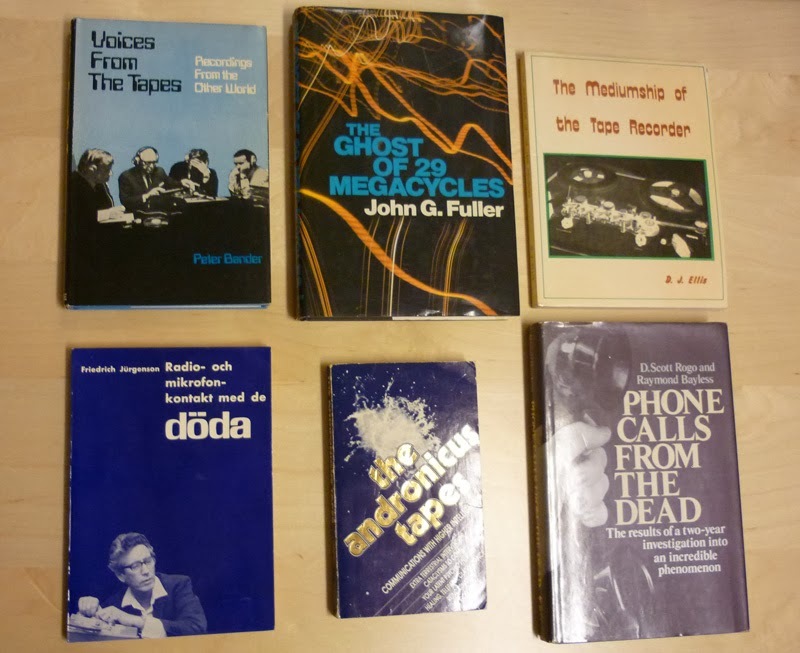 This appeal or idea has today taken a very concrete form in the two AFU libraries. 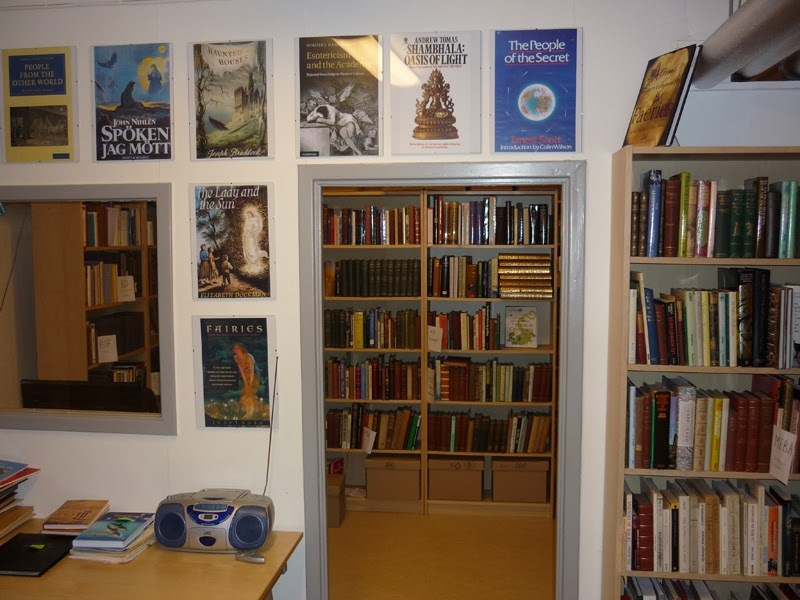 One contains basically UFO and Forteana while, what we have named, the Evans Library houses the unique and extensive collection donated by Hilary Evans in 2010. 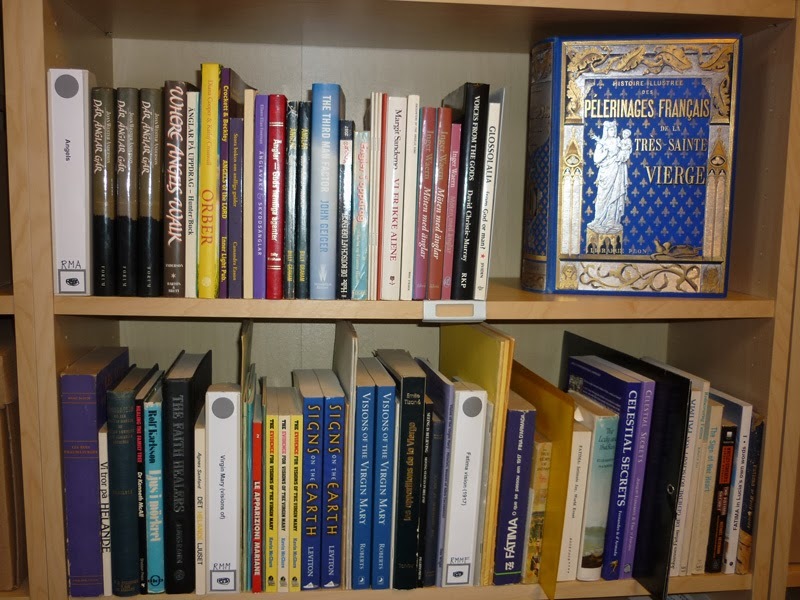 Here you can find religion, philosophy, folklore, psychology, parapsychology, paranormal phenomena, esotericism, spiritualism, secret societies - often old and rare volumes in English, French och German. 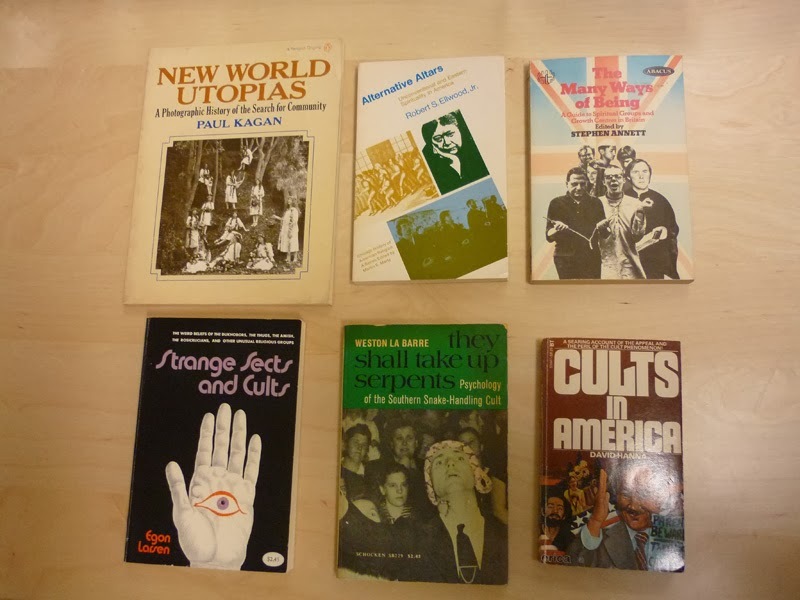 The collection is a treasure trove for academic students of History of Religion, Psychology of Religion, History of Ideas, Folklore and many other disciplines. 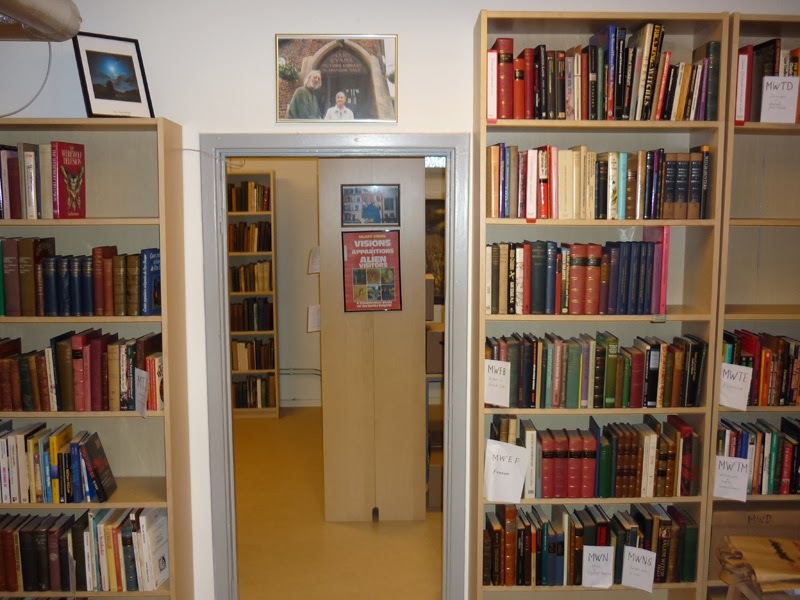 But of course also a valuable library aviable to all Swedish ufologists and Forteans who want unusual data or expand their intellectual horizon. 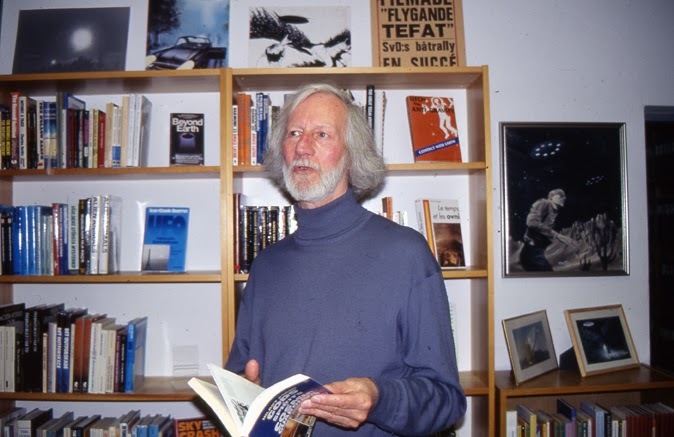 Maybe Hilary Evans had a precognition that his library would one day find its way to Norrköping when he visited AFU in 1996. 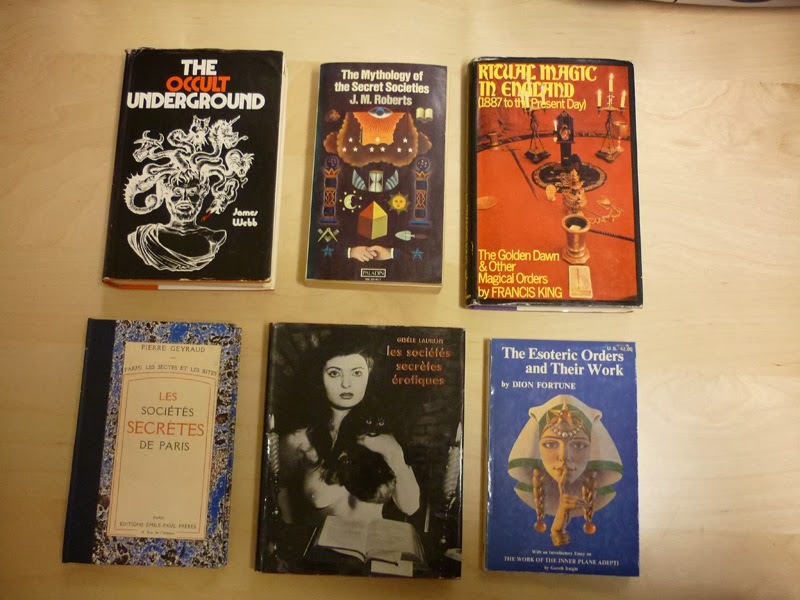 I have spent a couple of evenings perusing the shelves in the Evans library. 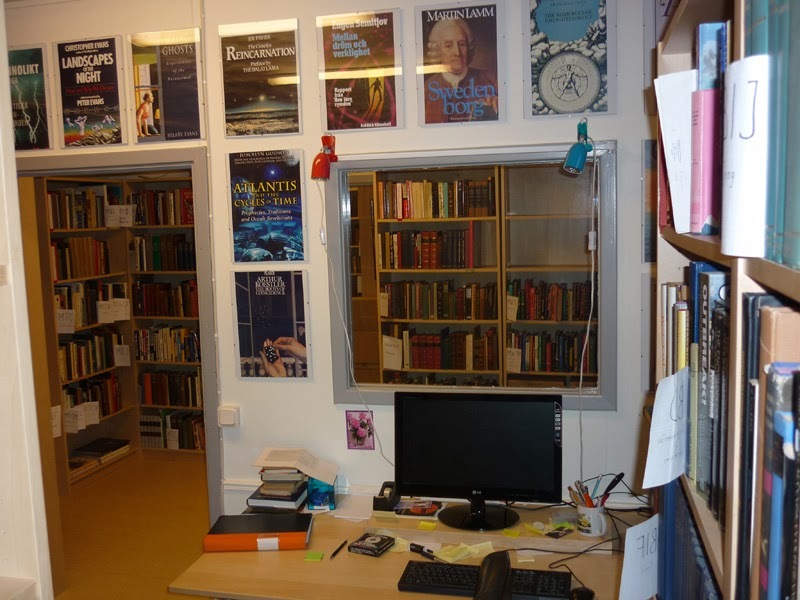 Most of the collection has now been unpacked from the boxes and catalogued by our three ambitious AFU co-workers Ingrid, Katarina and Helena. 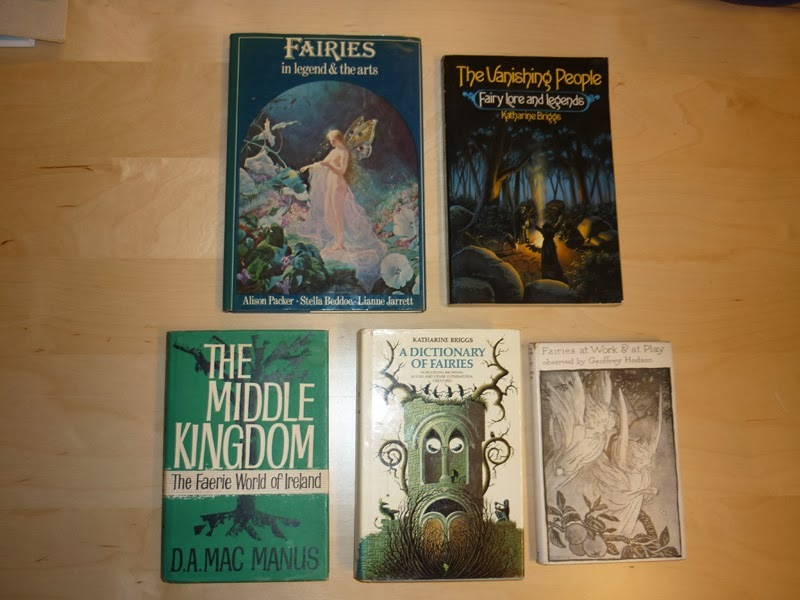 As a librarian I find it a pure joy to study all the fascinating titles and I decided to take some photographs of the premises and collections so that you blog readers can get a small estimation of this unique collection. Enjoy the show! 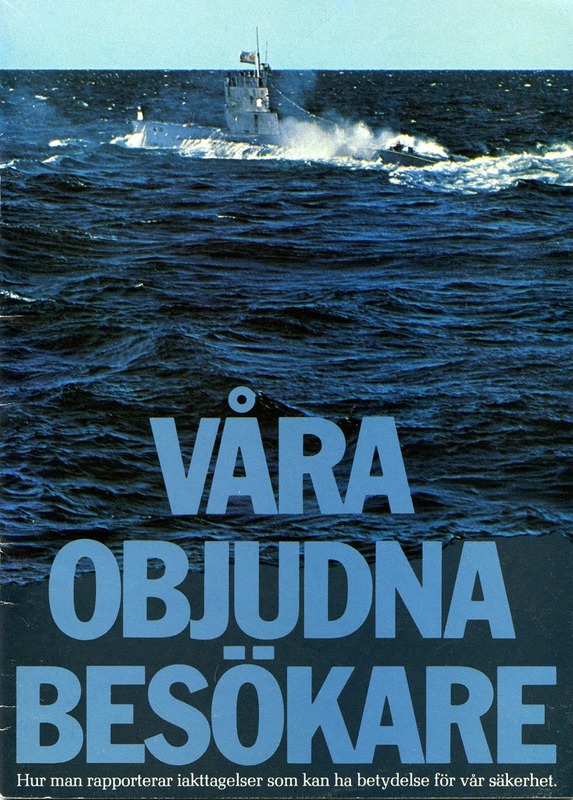 During the first years of the 1980s there was an intense wave of, what was believed to be, submarine infiltrations of Swedish territorial waters. 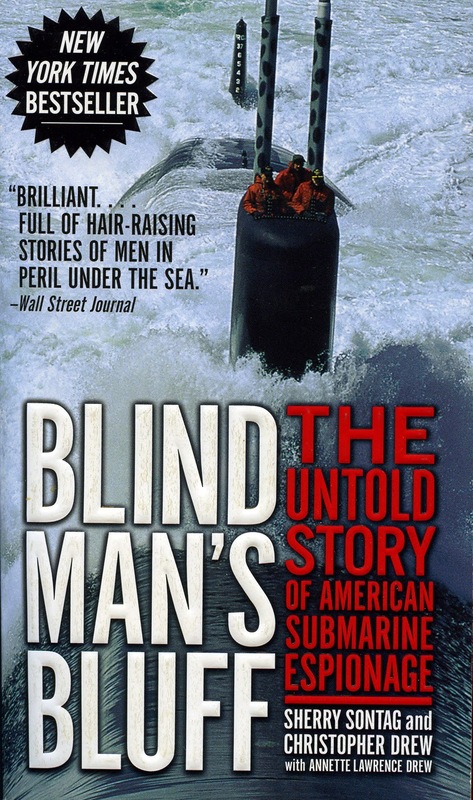 Hundreds of observations of unknown underwater vessels and activity including unidentified frogmen on land. 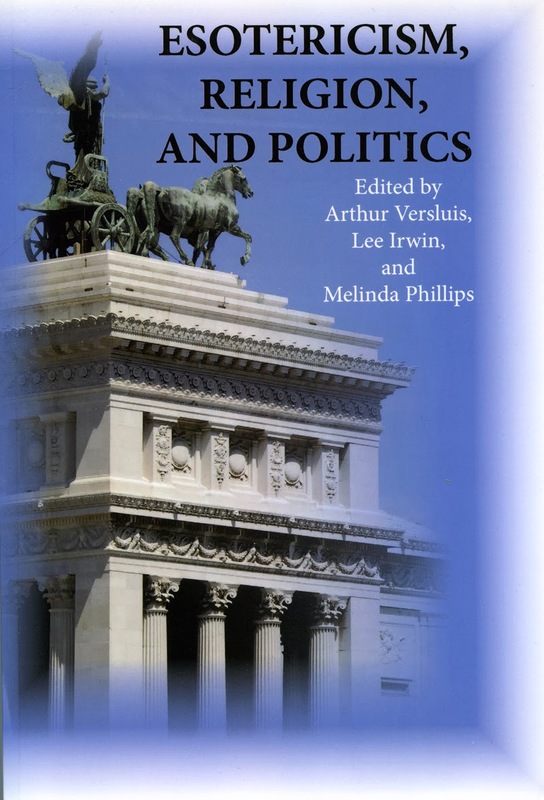 This resulted in a media hype of unusual strength with political debate and tensions. The cold war became close to hot on October 1-13, 1982 when the Swedish Navy used depth charges and naval mines trying to sink a submarine believed to be trapped in Hårsfjärden, in the Stockholm archipelago. The general view was that the Soviet Union was behind these intrusions. A seemingly logical theory as a Soviet Navy Whiskey-class submarine ran aground, October 27, 1981, on the south coast of Sweden, not more than 10 km from Karlskrona, one of the larger Swedish naval bases. The military authorities urged the public to report all unidentified objects and activity. 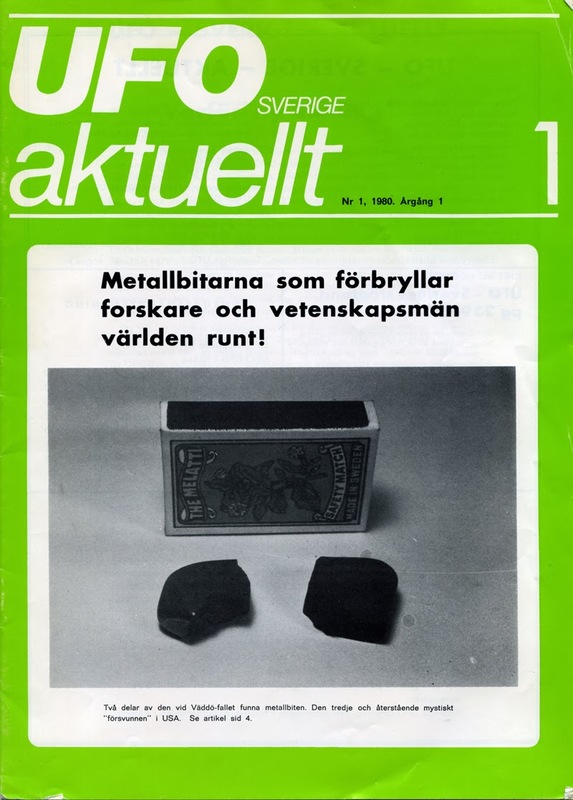 A small booklet, Våra objudna besökare (Our Unknown Visitors) was published by the Swedish military in October 1983. 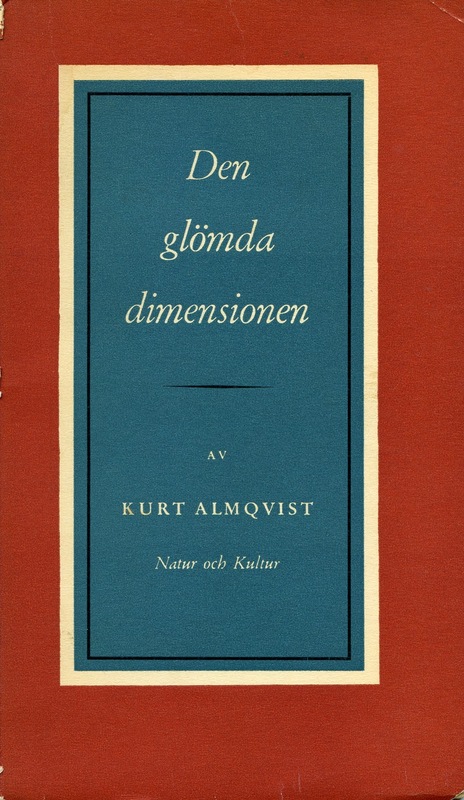 In his introduction Tunander mention the interesting co-incidence that the Hårsfjärden incursions started less than two weeks after the Social Democratic Party won the parlamentory election. Prime Minister Olof Palme was a democratic socialist who supported socialists like the Sandinistas in Nicaragua. He was an irritant to conservatives like Ronald Reagan and Margaret Thatcher. 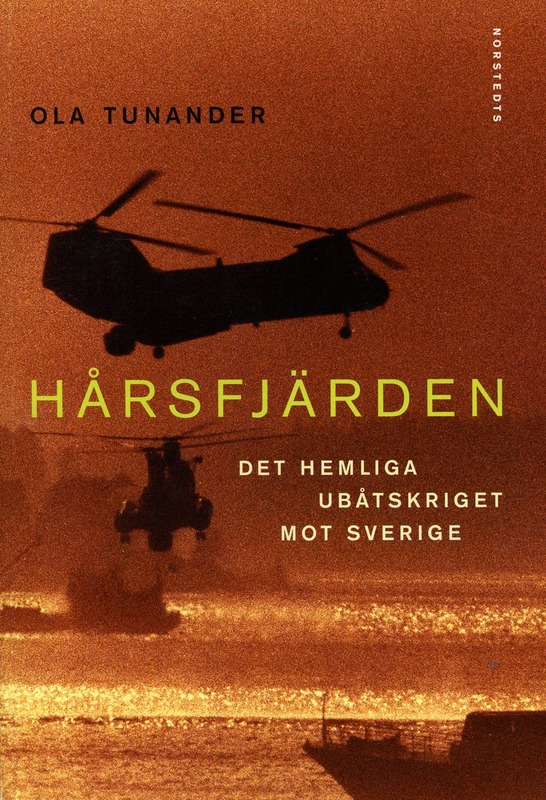 "The submarine war totally changed politics in Sweden. 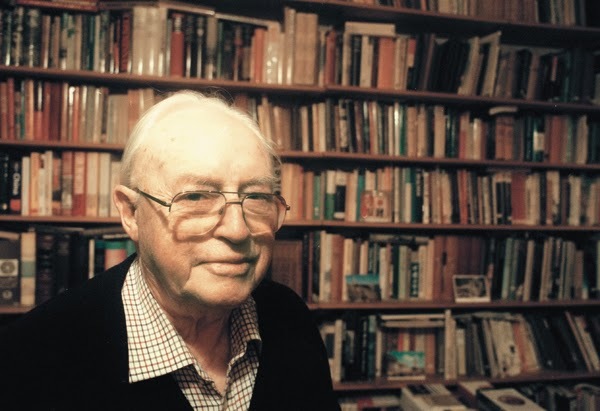 It placed the Social Democrats on the defensive and mobilized large parts of the population against the Soviet threat." (Tunander, p. 5) I personally remember the extreme hate campaigns against Olof Palme in the 1980s. Even Swedish mediums and psychics claimed that Palme was a secret Soviet spy. On February 28, 1986 Olof Palme was assassinated in Stockholm. 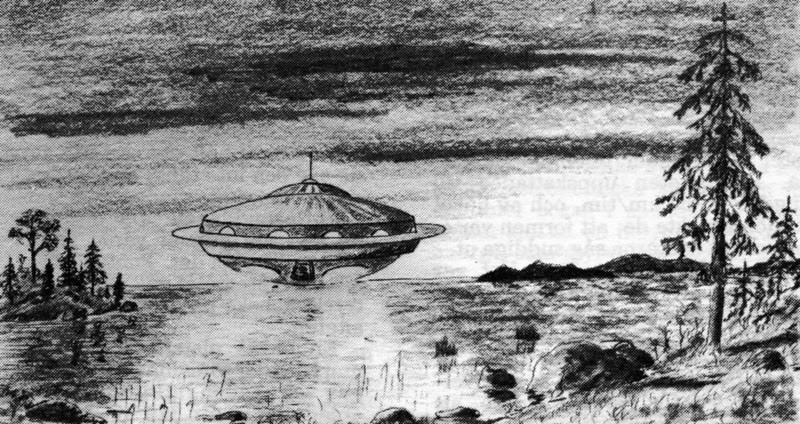 An interesting fact is that during the beginning of the 1980s there was not only intense underwater activity in Sweden but many intriguing close encounter UFO observations, sometimes in association with supposed submarine incursions. I personally investigated one of these cases that occurred on September 24, 1982. At 10 p.m. fire-fighters Christer Jonsson, Björn Lindh and Håkan Jonsson were on a training mission in a boat in Bråviken, near Norrköping. Radar suddenly indicates underwater activity, the water is foaming and a black circle appears in front of the boat. When they reach the black circle all equipment malfunction and the boat starts spinning of itself. First to the left and then to the right. No submarine is visible but something is obviously deep down in the water. The boat slowly glides out of the black circle and then the instruments starts functioning again. At the same time, a few miles further out in Bråviken a man and his wife have anchored their boat at Korsö. The night is clear with no wind. Suddenly a flying object appear slowly gliding above the boat. According to the logbook not more than 100-150 meters above the sea. 10-15 lights are seen in a circle on the object. It disappears to the north towards Kolmården. Was it a co-incidence that these two observations occurred at the same time? 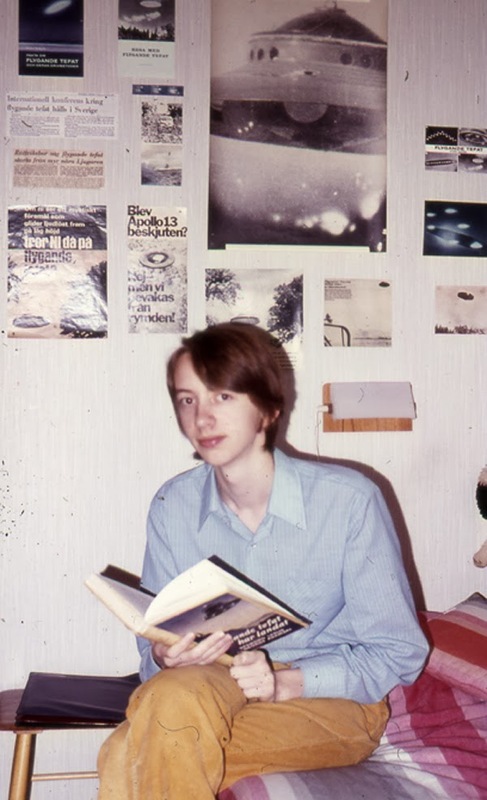 In 1981 UFO-Sweden received several UFO reports of objects with lights in a circle, all from Östergötland. 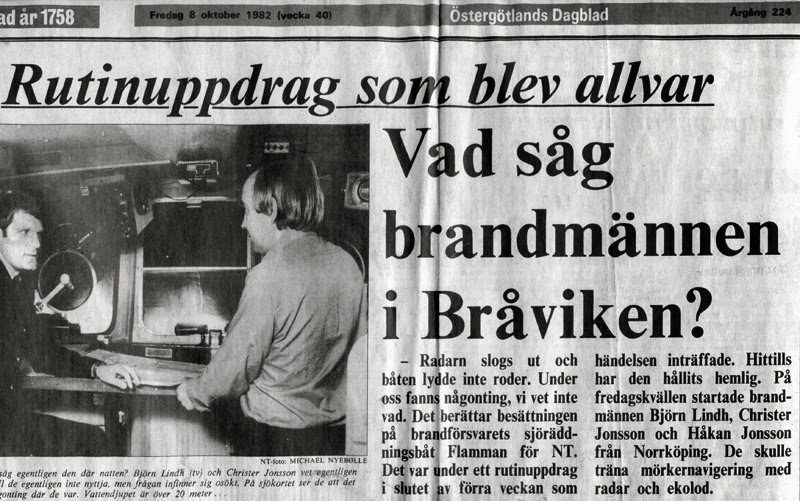 Another incident from the Östergötland archipelago occurred on August 28, 1982. 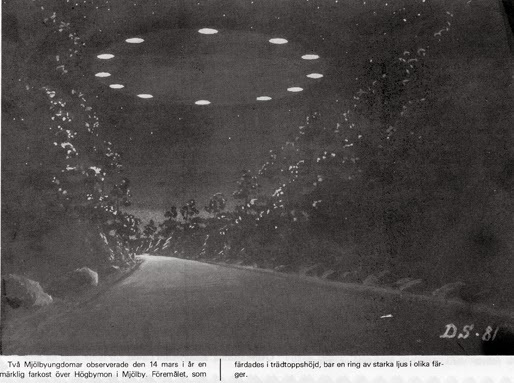 At 11.30 p.m. Bo Liss and his wife Åsa together with an anonymous witness observe a saucer shaped object at Flatvarp, not far from Loftahammar. They can follow this object for about five minuter doing various manouvres not more than 10 meters above the sea. There is no moonlight and the stars are visible. No sound is heard. The trio observere the object through a binocular and the distance was supposed to be not more than 300 meter. The light from the object was somewhat stronger than moonlight with a green light on top. A circular light was noticed on the sea under the object. Whether this was from a searchlight could not be determined. The group became rather frightened by the incident. So what do we have here? 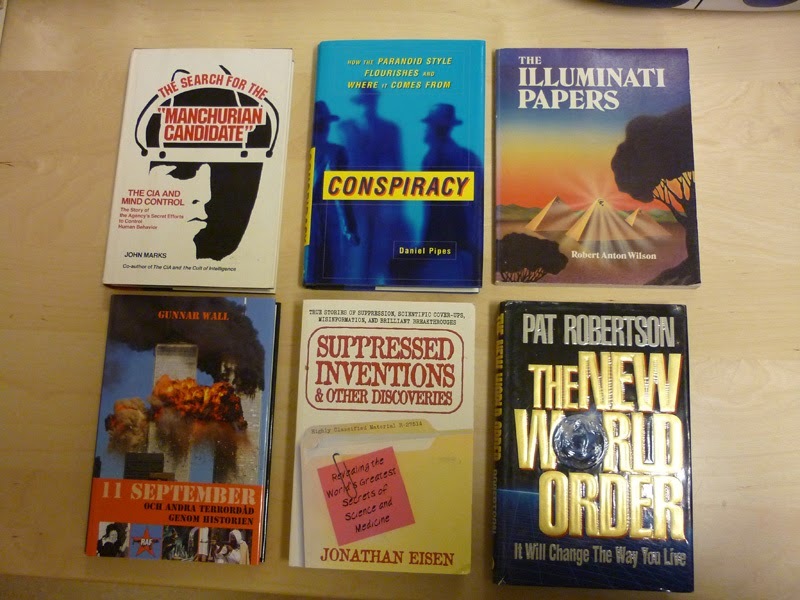 UFOs as part of false flag operations or evidence of a "third force" involved in some form of covert activity? I will take a second look at this third force theory in coming blog entries, especially when it comes to observations of mysterious frogmen.